This study was conducted by the Everyone Graduates Center (EGC) of the School of Education, Johns Hopkins University, with support from the Annenberg Institute for School Reform (AISR) of Brown University through the Bill & Melinda Gates Foundation and the College and Career Readiness Indicator (CRIS) effort which it sponsored. The study was carried out on behalf of the San Jose Unified School District (SJUSD), one of the four districts participating in the CRIS initiative. The intent of the study was that findings would assist SJUSD in understanding the characteristics of students who were and were not successful in graduating high school, and that it would inform future efforts to reduce the number of off-track students, increase promotion and graduation rates and lay the foundation for students’ post-secondary success, all goals outlined in the district’s strategic plan. 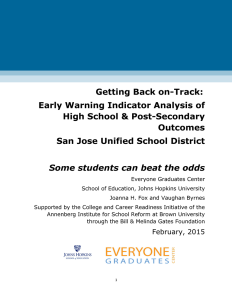 Establish the ninth-grade Early Warning Indicators, or EWI that were most predictive of high school graduation in SJUSD for this cohort. Prior research (see Research Summary and also the References) has established that the most efficient and effective EWI are typically attendance, behavior and course-passing, or the ABCs. Relate these ninth-grade characteristics and behaviors to post-secondary enrollment in the first two years of college. Delve more deeply into different college enrollment patterns. The students who got back on track largely resembled dropouts in terms of their demographic characteristics, attendance rates, and disciplinary issues. What set these students apart was higher academic achievement levels, reflected in test scores and students’ ability to progressively pass courses and earn the credits required for a diploma in the years after ninth grade. This group of students overcame the challenges raised by poor attendance and poor behavior that in combination with poor academics are generally predictive of student outcomes, absent interventions, years before the outcome event occurs. The study also examined college-going patterns for students from different demographic subgroups as well as for students with different academic and behavioral indicators. Clear differences were noted among students with different demographics, largely reflective of recently observed California patterns, e.g. that the percentage of Hispanic/Latino students who successfully graduate from high school and enroll in college is increasing, yet for various reasons these students are primarily enrolling in two-year rather than four-year colleges. Last, the study examined Limited English Students (LEP) and their progress in high school from ninth grade on. Hispanic/Latino students make up 51 percent of the SJUSD cohort and Asian students 16 percent. Against this background, LEP students make up approximately 13 percent of this SJUSD ninth-grade cohort and their success or lack thereof can be a significant driver in improving district-wide graduation rates and post-secondary entry as a precursor to post-secondary and career success. The 15 percent of the SJUSD cohort who exited LEP status prior to ninth grade, e.g. in elementary or middle school, had success rates that outstripped those of their LEP and non-LEP peers. These LEP students succeeded in graduating from high school and enrolling in post-secondary school at rates far higher than those of students who remained in LEP status into ninth grade and equal to or better than those of students who were never in LEP status. Qualitative data were not available to explore possible reasons. This group of students overcame the difficulties presented by being non-English speakers in an English-speaking school environment. National data consistently show that LEP students typically achieve graduation at rates considerably lower than non-LEP students. Repeat this study with a second longitudinal cohort, particularly exploring the category of students with learning disabilities who, for reasons that are unclear, are underrepresented in the cohort examined in this study. The correlations in the present study suggest that the category of students with disabilities does not impact study conclusions; previous Johns Hopkins studies in other states and districts confirm this, yet given the national and state disparities in graduation rates between regular students and students with disabilities it may be advisable to confirm this with additional cohort data. Learn more about the contributing factors that enable some students to overcome ninth-grade indicators, re-channel their energies, beat the odds and experience high school and postsecondary success, using qualitative data obtained through interviews, focus groups and if possible/available, surveys of both students and adults. Develop an early warning indicator and intervention system that in addition to identifying students who are challenged by the ABCs (attendance, behavior and course-passing/credit accrual) and supplying interventions in an organized manner, enables schools to identify and nurture potential “beat the odds” students early on – with the goal of creating and supporting more “beat the odds” students. Work with school leadership to set benchmarks or targets for growth in identification and support of all students and of “beat the odds” students and for these students’ success. Through the early warning indicator and intervention system, target those students who most need additional supports to graduate, including all students and “beat the odds” students, and address the specific areas in which students need support to stay on-track and earn a high school diploma – and to bolster their college readiness. Examine district and school policies and practices related to attendance, discipline, grading that can influence student success positively or negatively. Refine and re-develop and implement policies and practices that encourage and support all students and those who are beating the odds to aim higher than high school graduation and two-year colleges in preparing for and enrolling in post-secondary schooling. Based on all these recommendations, redesign as necessary district, school and classroom policies and practices to further student success. Click here to download the complete report in Adobe PDF format.